Vocal Strengths: Unique and prominent coarseness to the voice, with a throaty and guttural chest voice. Despite the heavier weight of the voice the belting range could extend high up into the fifth octave by mixing while retained this characterful rasp. The head voice was bright and full, with a smoother, delicate contrasting texture to the lower half of the voice. Her control in this part of the register was surprisingly strong and deft. Though her voice is remembered for its passionate rasp, it was also capable of a softer and smoother timbre, demonstrating the skill and ability she had as a vocalist. Interestingly, the frayed edges of the notes sang with this textured timbre sometimes allowed for harmonic chords to be created as two or more tones were produced by the voice at the same time. Vocal Weaknesses: The coarsness of the voice could be found abrasive by some. Mariah Carey is far from the spotilght but still beats up every new diva. Her 94's classic All I want for christmas is you reached the first place on Billboard chart. ONCE again, Mariah??? Justin Bieber a Michael Bublé recovered the song but the original won the race once again. 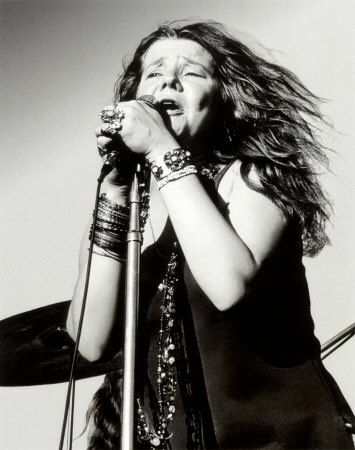 Looking for backers to fund a theatrical musical about the life of Janis due in theaters this fall through out the midwest. What have Mariah Carey and Justin Bieber got to do with Janis Joplin? Wtf is Justin boober and mariah crazy doing in JANIS JOPLIN's page? it's like ur in the presence of greatness!! get these 2 dumb asses out the site! She was one of "THE GREATEST FEMALE SINGERS" to have ever surfaced in any genre of music but particular that of 'Rock/Soul/Blues'. I absolutely admire this Woman. She was definitely a Mezzo-Soprano; Full-Voiced Lyric in her earlier years (1964 - 1967) but her tone became much more Metallic- sounding (Dramatic) in her later years (1968 - 1970). I MISS THIS AGE OF FEMALE SINGERS. She was a soprano...not a mezzo.Her voice was very sweet and child-like.Even if it was rapsy. So much vocal fry, though, and through the whole range. It's almost polyphonic in places.